I’m totally on board with the SAnitY-Undisputed Era feud. 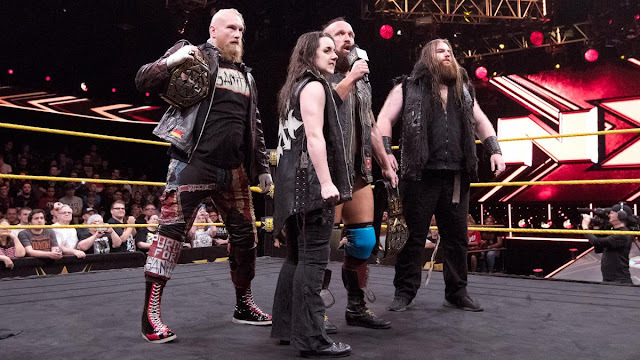 Eric Young, Alexander Wolfe, Killian Dain, and Nikki Cross are some of the most entertaining members of the NXT locker room, while the hype train for Adam Cole, Bobby Fish, and Kyle O’Reilly is still running at full speed. We’ve never had two big stables running around NXT at the same time before, so this gang war feels fresh and new. While I’m completely sold on the SAnitY face turn, I’ll have to acknowledge that there are still some kinks to the execution. The pop they had when they came into the ring through the crowd was huge, but EY’s promo to start the episode felt a bit flat. Young’s a fine promo, but I feel like, at this point, he shouldn’t be dominating the group’s mic time when Wolfe’s proven himself to be captivating on the stick as well. Compared to that, Adam Cole’s pre-match promo was great. He came off as arrogant and brash, which makes sense as a heel blue-chip signee. His branding game might be a bit off; “We are undisputed, and this is our era now” was a weird line, even if it does drop the name of the faction. That said, the main event match was good. If you don’t know what Cole can do in the ring, then, first, where have you been the past decade, and, second, this served as a solid introduction to Cole’s ring work. This match gave you a glimpse of how smooth his movements are, how polished his character work is, and how great he makes his opponent look with his selling. There’s still so much to see from Cole, but this should be enough to have you wanting for more. The finish was well done; it felt right when EY decided to dive into the chaos of the brawl instead of attacking his opponent, and Cole looked like an opportunistic heel when he nailed the Shining Wizard. This match did all you expected from it: it hyped Cole, teased enough to get you excited and furthered the angle between both groups. The feud between SAnitY and the Undisputed Era should continue after this match, and I’m excited to see how it plays out over the next few weeks. More importantly, Adam Cole finally debuted in a WWE ring, and this is a good start to his WWE career. I’ve been waiting for Cole to be part of the WWE for a couple of years now, and seeing him actually wrestling for the company is both surreal and incredible. What the future holds for Cole, Fish, and O’Reilly, I don’t know; but it’s definitely starting to look like it’s their era now. Lars Sullivan def. Oney Lorcan: This was all kinds of awesome: just too gnarly men going at it. Lorcan played the role of underdog well here; he brought his stiffest shots and never looked cowed in front of his larger opponent, and it's why it's so easy to get behind his character. Sullivan just destroying Lorcan with one lariat was a great spot, and adds to his monstrous look. Danny Burch coming out to save Lorcan was a great way to tie in their story, and this might be the start of a tag team between the two. That’s a logical next step for their story, and I’m a fan of this decision. Heavy Machinery def. Demitrius Bronson and Patrick Scott: This was a fine squash match, but I’m starting to lose interest in Tucker Knight and Otis Dozovic. We’ve pretty much seen this type of match from Heavy Machinery many times already, and it’ll serve the team well to get involved in an angle before they get completely lost in the shuffle. I would probably pair them up with the Street Profits, who are a great up-and-coming duo who’ll need to feud with another team soon as well. That should be interesting. Liv Morgan def. Vanessa Borne: This was pretty mediocre, which is to be expected out of these two. You would’ve thought Morgan will have improved by leaps and bounds now that she’s been around for almost two years, but she hasn’t grown as much. There’s still some awkwardness to her moves, and at this point, it speaks to her ceiling as a Superstar. Vanessa Borne wasn’t great in the Mae Young Classic, but she still has time to learn, so I’m just hoping she doesn’t have the same development arc as Morgan. Kassius Ohno def. Fabian Aichner: This was easily the best match of the night, which comes as a surprise. Aichner’s NXT debut was beyond expectation—granted, I don’t remember him much from the Cruiserweight Classic, so I didn’t expect much to begin with. He has a great mix of high-flying and power in his move set, and the fact that he’d bulked up sets him apart from other CWC participants still in the WWE. He’s one of the few who's being allowed to play with heavyweights, aside from Tommaso Ciampa and Johnny Gargano. This opens him up to more possible match-ups and gives him more opportunities to showcase his talents. Ohno did great in selling Aichner’s offense as well and made him feel big. Ohno won the match, no surprises there, but Aichner won over the crowd. In terms of in-ring action, this was a great episode of NXT. Sullivan/Lorcan was great, as well as Ohno/Aichner. Cole’s debut was fine too. A lot of things were crammed into the hour, though, so it felt a bit rushed. Between the five matches, two promos, and a handful of backstage vignettes, there were so many things going on without giving people enough time to breathe and absorb all the info. We know NXT can manage their hour better—we’ve seen them do it before. That said, I still can’t help but give this an A-, just because Adam Cole’s finally wrestling for the WWE, and that’s great. 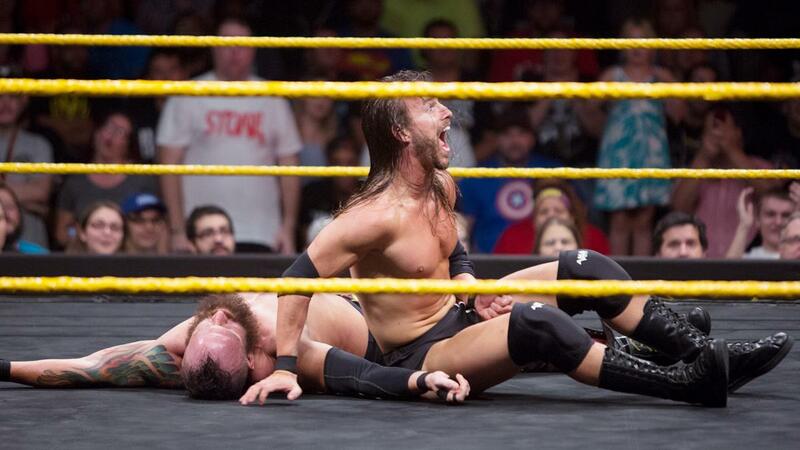 Thoughts on Adam Cole's debut? Let us know in the comments section.